Funky Town. All photography by Daniel Walker. These are 15 of the best varieties in town. The doughnut game in Dallas is undeniably strong. When last we compiled our picks for best in town, there were only a few players really pushing the proverbial envelope. But today, there are a host of exciting vendors popping up in every corner of the city. 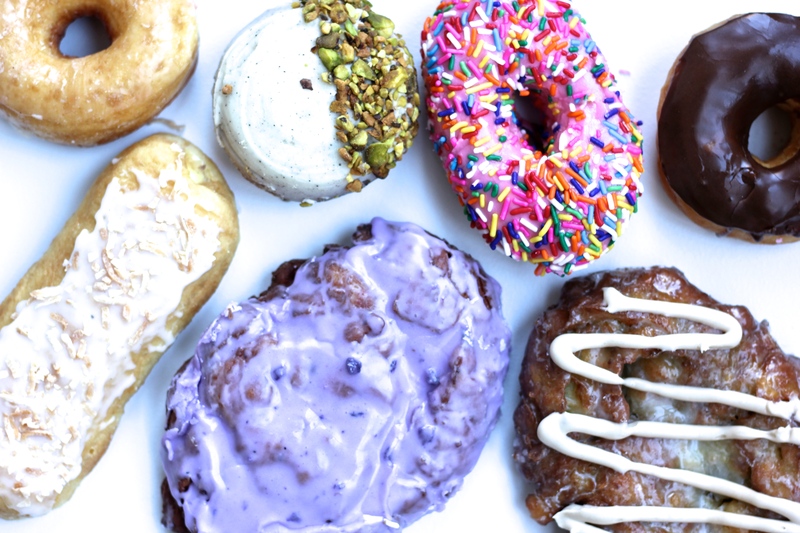 Here are 15 of the best doughnuts from the most notable shops around town. Consider this your ultimate doughnut to-do list. The brains behind the sweet creations at Deep Ellum’s beloved shop never cease churning out inventive new flavors. Seasonal offerings and holiday specials are the norm here, so you’ll want to keep an eye on their various social media platforms for updates. But one flavor that’s almost always on the menu board is their sumptuous Saigon Cinnamon Sugar. It may look a bit ho-hum at first glance, but don’t be fooled by its humble appearance. There’s a subtle spice intertwined with a crunchy sweetness from granulated sugar, all coating one of the finest brioche-style yeast raised donuts in town. Blessed was the day when the celebrated Seattle-based Top Pot decided to open its very first location outside of Washington in our very own Big D. The fried-pastry-gods truly smiled down on us that day. Now with four locations across the city, it’s fairly easy to experience Top Pot’s “hand-forged” approach for yourself. Where they excel most is undoubtedly in “old fashioned” doughnuts, of which, you’re going to want to sample the salted caramel variety. These suckers have a slightly crunchier exterior, with a soft, cake-y middle. The sweet and salty combination from the salted caramel puts this particular doughnut over the top. In the best way imaginable. At this Sherman bakery, owner Mo Guerrero has established a loyal following of fried-dough fanatics that are, surprisingly, also big names in the bodybuilding and Crossfit community. The virtues of “donuts and deadlifts” are something Mo proudly embraces. “Our bodybuilding and Crossfit community loves us because carbs are not only great before leg day,” he says. “But we’re a treat that competitors look for after enduring strict diets in preparation for a bodybuilding show.” Momo’s popularity even landed them a spot on Cooking Channel’s Donut Showdown. And although they’re located in about an hour-and-a-half outside of Dallas, this popular donut spot will graciously deliver to Dallas every weekend for any who preorder (just message them on Facebook or Instagram @momosdonuts). Just be sure to order the Strawberries and Cream, stuffed full of plump, glazed strawberries and fresh cream. This humble Farmer’s Branch shop remains relatively unknown to most doughnut fans outside its immediate surroundings. It’s the epitome of old-school doughnut making: no outrageous toppings, no particularly fancy ingredients. Most of its employees have been hammering out the same recipes for more than 40 years—and they’ve darn near perfected their craft. The apple fritters are some their most elusive creations. It’s difficult to time exactly when they’ll be laying out a fresh tray…and when they do, they get snatched up quickly. Instead of the typical chopped, diced, and reformed dough bits that make up the apple fritter, Jerry’s serves one that’s more akin to a turnover, with the hot apple filling folded into the center of the dough, cooking in layers throughout the dough. It’s a bit unconventional, but it’s absolutely lovely to bite into. For five-and-a-half years, Jarams has been supplying North Dallas sugar junkies with a very sound reason to roll out of bed on a weekend morning. They were among the first in the city to capitalize on the “Cronut” craze sweeping the nation at that time, and quickly built a reputation for serving donut varieties that couldn’t be found anywhere else in town. But one donut still shines above the rest, though it may not necessarily be the wackiest item they offer. This one comes topped with a smooth, not-too-sweet cream cheese frosting on a soft, yeast doughnut, and is finished with a crown of fresh assorted berries and a whiff of powdered sugar. It’s still deep-fried dough, but you can almost convince yourself you’re eating a fruit salad for breakfast. Almost. Okay, not really. This small shop is conveniently located a mere stone’s throw from Love Field. So if you’re about to jump on a plane and are in need of a quick breakfast, look no further than Mojo. With a healthy assortment of doughnuts both traditional and elaborate, there’s plenty to keep any pastry fan coming back on a regular basis. Just be sure to snag one of their decadent cookie butter donuts when they’re on the shelf. This soft yeast-raised treat comes dipped in creamy cookie butter frosting, sprinkled with cookie crumbles, and finished with another thick gob of cookie butter in the center. It’s rich and a little messy, but it’s wonderful. Forget not Fort Worth when looking for exceptional doughnuts. FunkyTown has dominated this city’s scene since opening just over a year ago. Folks go nuts for their impressive array of doughnuts, so much so that they sell out nearly every day. The Key Lime Pie variety is a must. A yeast doughnut is topped with a citrusy lime glaze and stuffed with freshly-made whipped cream and graham cracker dust. It’s a Key Lime creation so good it will mentally transport you to an exotic white-sand Florida beach on a sunny afternoon. And once there, you won’t even mind that you’re destroying your beach body. When founder, James St. Peter, established Hypnotic in 2010, there was no one else on the donut scene putting as much thought into doughnuts as him. Hypnotic built a dedicated underground following via Facebook and Twitter, selling donuts from the back of a Ford Expedition for months until demand reached a level that forced them to move into a permanent space. Today, Hypnotic’s place among Dallas’ fried-dough-royalty remains firmly intact. They’ve pioneered the “fancy” market with a collection of intriguing options, but one that remains at the top of the crop is the Peace’statio, a lovely cake variety topped with brown butter glaze and chopped pistachios. It’s the perfect way to wash down one of their sizable chicken biscuits. 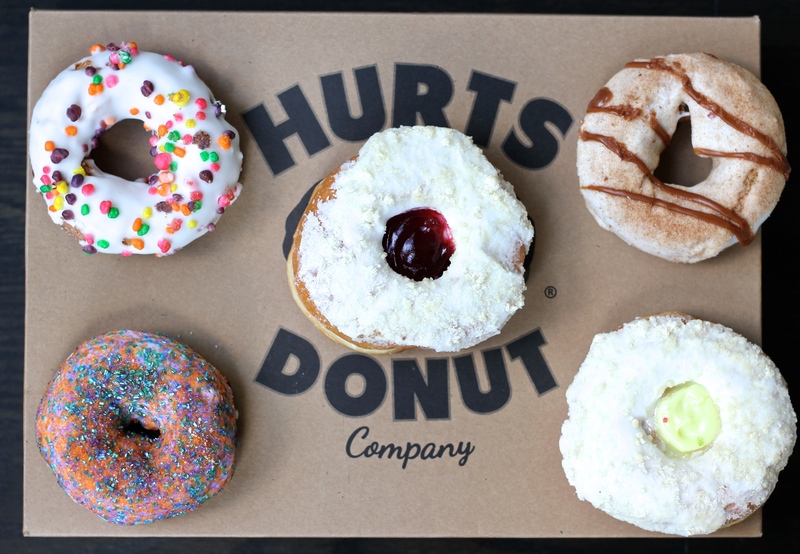 This Lewisville shop is quietly putting out some of the greatest donuts in Dallas. If you’re looking for the finest “Cronut,” Earnest is your place. But the best reason to visit the shop is for their exceptional blueberry crumble cake doughnut. It’s packed with real blueberry, within a cake doughnut that’s not the slightest bit dry. They coat the whole thing with cake crumbles for a slightly crunchy textural element that really brings the whole thing home. Well played, Earnest. At this Fort Worth food truck, things operate a bit differently than your standard doughnut shop. It’s just two guys in a tiny space, one taking orders and the other continuously throwing dough into hot oil. But because of their limited space, they’re churning out sweets practically to-order, ensuring that every doughnut served is fresh from the fryer—hot, soft, and golden brown. Go with the Cinnamon Roll variety. It’s less flashy than some of their other offerings—a simple sugar glazed with streaks of cinnamon-sugar drizzle—but it’s beautiful. 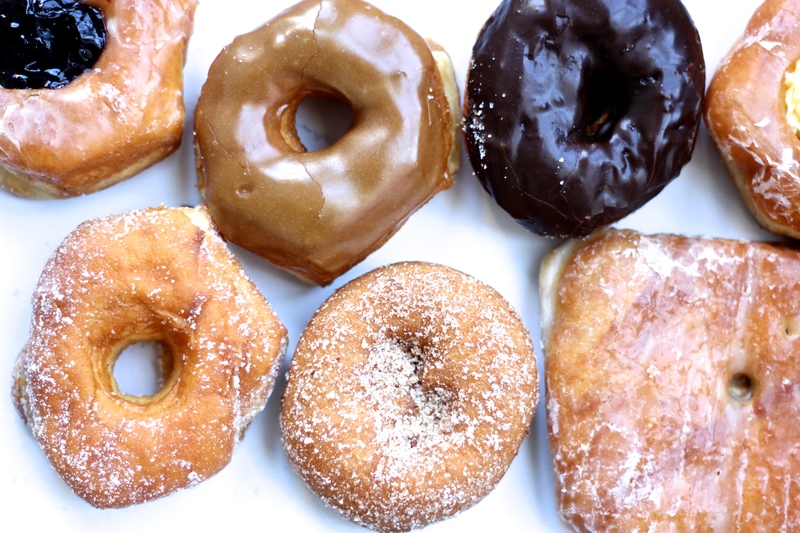 How much does Frisco love this small Midwest doughnut chain’s first Texas location? Just take a peek at the lines. They frequently push out the door and around the building, with customers reporting waits of up to an hour during peak business. But they’re able to crank out quality donuts fairly quickly, and do a good job keeping their massive display cases filled. Generally, their yeast-raised donuts—which are larger and plumper than you’ll generally find at your average shop—outshine the cake variety. Most of their doughnuts are big, bold, and almost cartoonish, but you’ll find that the frosted jelly-filled one is everything you need it to be without all the excess. This McKinney staple sticks solely to cake donuts. But even if you generally prefer yeast-raised doughnuts, the cake variety served up here are not to be missed. They nail it on texture—never dry, light, and slightly crumbly. Truth be told, they’re probably the best cake doughnuts in town. Grab the Italian Wedding: rolled in sugar and topped with a swirl of cream cheese icing and pecans. The food world has become obsessed with novelty mash-ups, but only a select few to hit the market survive and are actually worth tracking down. The doughnut-waffle was not dreamed up here at this small Little Elm shop, but they were the first to bring the concept to town. And luckily, they’re good. Darn good. It’s got all the right textural elements of a successful waffle—crunchy exterior and soft, chewy inside—but the thin layer of glaze takes it to a new level of decadence. You can get them coated in candy if you like, but it’s really not necessary to achieve peak enjoyment. Allen residents have long known that the finest glazed doughnuts in town were hiding in this tiny, no-frills shop. It’s a classic joint serving a simple menu of only a few standards: plain glazed, chocolate iced, apple fritters, and cinnamon rolls. But if you’re occasionally exhausted by all the glamorized, fancy doughnuts across town, and you’re most interested in a classic glazed ring of fried dough, the best is right here at Max’s. That’s right…the best plain glazed in town. And that’s a promise you can take to the bank. Here’s another small donut franchise that’s already making waves within the northern suburbs. Although they are technically a chain, these are a far cry from the likes of sub-par, chain establishments. Rise simply makes a spectacular product. They do a dangerously good creme brûlée donut with a thick, crunchy shell of torched sugar, filled with a custard that sings of real vanilla. But their most interesting, and surprisingly successful variety, is the Pineapple Basil doughnut with pistachios.